17-year-old Haley McWaid is a good girl, the pride of her suburban New Jersey family, captain of the lacrosse team, headed off to college next year with all the hopes and dreams her doting parents can pin on her. Which is why, when her mother wakes one morning to find that Haley never came home the night before, and three months quickly pass without word from the girl, the community assumes the worst. Wendy Tynes is a reporter on a mission, to identify and bring down sexual predators via elaborate-and nationally televised-sting operations. Working with local police on her news program Caught in the Act, Wendy and her team have publicly shamed dozens of men by the time she encounters her latest target. Dan Mercer is a social worker known as a friend to troubled teens, but his story soon becomes more complicated than Wendy could have imagined. 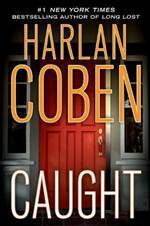 In a novel that challenges as much as it thrills, filled with the astonishing tension and unseen suburban machinations that have become Coben's trademark, Caught tells the story of a missing girl, the community stunned by her loss, the predator who may have taken her, and the reporter who suddenly realizes she can't trust her own instincts about this story-or the motives of the people around her.